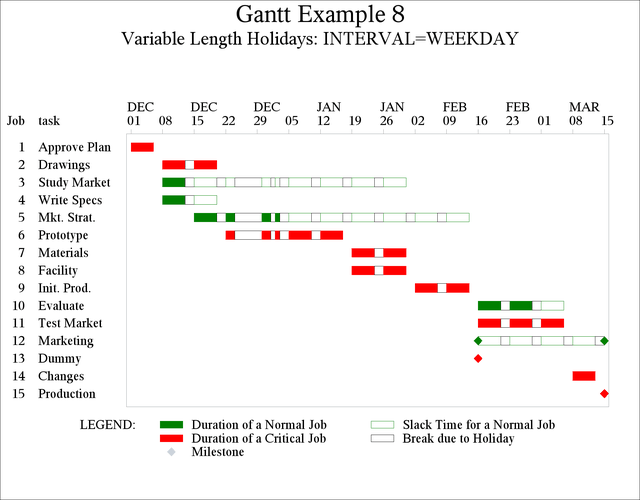 This example shows how you can mark vacation periods that last longer than one day on the Gantt chart. This can be done by using the HOLIDUR= option in the CHART statement. Recall that holiday duration is assumed to be in interval units where interval is the value specified for the INTERVAL= option. The project data for this example are the same as the data used in the previous example. Suppose that in your scheduling plans you want to assign work on all days of the week, allowing for a Christmas vacation of four days starting from December 24, 2003, and a day off on January 1, 2004 for the New Year. The data set HOLIDAYS contains the holiday information for the project. First, the project is scheduled with INTERVAL=DAY so that the holidays are on December 24, 25, 26, and 27, 2003, and on January 1, 2004. PROC GANTT is invoked with INTERVAL=DAY to correspond to the invocation of PROC CPM. The desired font is specified by using the FONT= option in the CHART statement and the F= option in the TITLE statement. As an alternative, the desired font can be specified globally by using the FTEXT= option in a GOPTIONS statement. 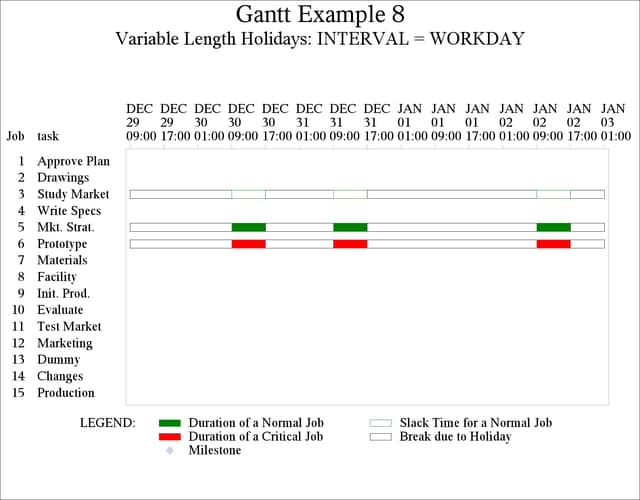 The resulting Gantt chart is shown in Output 8.8.1. Next, consider the same project and Holiday data set, but invoke PROC CPM with INTERVAL=WEEKDAY. Then, the value '4' specified for the variable HOLIDUR is interpreted as 4 weekdays. The holidays are on December 24, 25, 26, and 29, 2003, and on January 1, 2004, because December 27 and 28 (Saturday and Sunday) are non-working days. The same steps are used as previously, except that INTERVAL is set to WEEKDAY instead of DAY in both PROC CPM and PROC GANTT. Suppose that the resulting data set is saved as SCHED2. The following invocation of PROC GANTT produces Output 8.8.2. Note that the use of INTERVAL=WEEKDAY causes weekends to be also marked on the chart. Finally, when the INTERVAL= option is specified as WORKDAY, the workday is assumed to be from 9:00 a.m. to 5:00 p.m., and the Christmas holiday period begins at 5:00 p.m. on December 23, 2003, and ends at 9:00 a.m. on December 30, 2004. PROC GANTT is invoked with the MARKBREAK option and MININTERVAL=DTHOUR so that all breaks during a day can be seen. Because the SCALE= option is not specified, each column denotes one hour of the schedule. 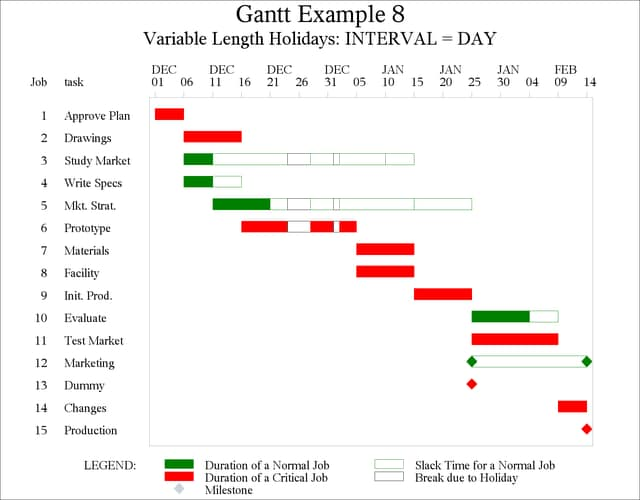 Since the project duration is several days long, the entire Gantt chart would be spread across many pages. Simply specifying the COMPRESS or PCOMPRESS option will not be of much help since the text would be barely legible owing to the extent of the scaling. Hence, only a portion of the Gantt chart is shown in Output 8.8.3 using the MINDATE= and MAXDATE= options. Note that the Gantt chart is labeled with the date as well as the time values on the time axis.